Outdoor adventure travel in Canada comes in a variety of forms. Canada, America's neighbor to the north, is the world's second largest nation. This vast country spans from the North Atlantic island of New Foundland to the vast wilderness of the Yukon to the arctic tundra surrounding the north coast of Hudson Bay. Canada offers a myriad of outdoor adventures - fishing, skiing, and hiking, among others. Below is just a sample of what this scenic and friendly country has to offer. Canadian fishing is well-regarded throughout the world. From lake trout and bass fishing on Canada's many lakes to salmon fishing in the Pacific Northwest to Atlantic char and salmon fishing along the Atlantic coast, Canada offers hundreds of excellent fishing sites. Adventures range from Great Lakes fishing day charters to week-long fly-in lodge retreats, with everything in between. For a sampling of what's available in Canada for fishermen, see this comprehensive list of fishing outfitters. Mont Tremblant - Mont Tremblant, in Canada's Quebec Province, is a favorite of east coast skiers. Nestled in Canada's Laurentian Mountains, this resort, established in 1939 has 93 ski runs and an elevation of over 3000 feet. During the summer, Mont Tremblant is popular with golfers, hikers, and water sports enthusiasts. Whistler - Whistler, in British Columbia (pictured above) is one of Canada's most popular young ski resorts. Established in 1966, Whistler and adjacent Blackcomb feature over 200 ski trails in over 8000 acres of skiable terrain with a 5000 foot vertical drop. 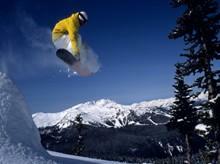 Whistler plays host to over two million visitors annually and has been chosen to host the 2010 Winter Olympics. During the summer months, Whistler is a favorite of mountain bike enthusiasts. Ski Banff - Banff, in southern Alberta Province, is home to a number of popular ski mountains, including Mount Rundle, Mount Torquay, and Cascade Mountain. The Banff Torquay Resort, established in 1926, features 33 ski runs and a snowboard park. Nearby Sunshine Village ski area features over 100 ski runs and has an elevation of almost 9000 feet. During the summer months, Banff is popular with nature lovers, hiking enthusiasts, and mountain bikers. In addition to its many outdoor sport activities, Canada has a varied, historic, and picturesque collection on National Parks. Among these 47 parks are Jasper and Banff National Parks in Alberta, Glacier National Park in British Columbia, Fundy National Park in New Brunswick, Cape Breton in Nova Scotia, and Saquenay-St. Lawrence in Quebec. Most of Canada's National Parks offer facilities for camping and many also have lodge accommodations. Activities vary, but the scenery is spectacular wherever you go. Making reservations for outdoor adventure travel in Canada is relatively easy. For straight-forward ski vacations, you can contact the resort directly for a variety of travel packages that include accommodations, ski lift tickets, and other inclusions. For more specialized trips, such as adventures to remote fishing lodges, seek the assistance of a company that deals with that particular travel niche. For Canada fishing trips, consult this list of regional fishing charters, guides and outfitters.